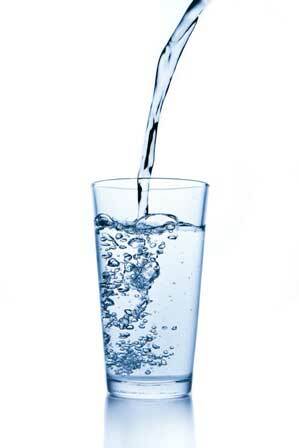 The majority of people only drink one glass of water a day. In the UK, drinks make up between 70-80% of our water needs, the rest comes from food. If you drink too little, you will tend to eat more. Water makes up about 60% of the weight of a healthy body. A study in April 2015 revealed that motorists who are dehydrated make twice as many mistakes. Other than feeling thirsty, other indications that you need to drink more water could include: fatigue and/or dizziness, mood swings, lack of concentration, chills, muscle cramps, back or joint aches, dull/dry skin, constipation, infrequent urination and/or dark concentrated urine, headaches, bad breath or sugar cravings. Why do we need to ensure we are drinking enough water? Fluid balance within our bodies; since roughly 60% of our body is made up of water, it is important that we drink enough as this helps our body to transport much needed nutrients around the body. Water helps to regulate the body temperature and it helps to digest food. Reduces muscle tiredness; muscles themselves are about 70% water so when you exercise and sweat your muscles are losing water. In order to remain at your maximum physical performance you need to ensure you are drinking liquids. Studies have shown that losing as little as 1-3% of your body’s water can dramatically impair your physical performance. Helps with weight loss; there have been a number of studies that have proven that there is a link between how much water you drink and how much weight you lose. This simply comes down to the fact that water helps people feel full and as a result means less food is consumed. Could help to prevent headaches; one of the most common types of headaches; tension headaches, could be caused by dehydration. Drinking more could potentially stop the headache or reduce the intensity and duration. May help to relieve constipation; evidence has shown that a lack of water consumption is a risk factor for constipation. Drinking more will aid with digestion. Boosts your immune system; water oxygenates your blood, which allows it to get plenty of oxygen around to the cells of your body, allowing them to function better. Your cells are able to take in more nutrients and also expel waste products (toxins). Without enough water these toxins will continue to build up and weaken the immune system. Removes toxins; our bodies remove toxins through sweat and urination, so if you are hydrated well then your body will be working at an optimum level. This will help to reduce risks to such things as kidney stones and urinary tract infections (UTIs). Helps with the production of lymph; our bodies use lymph to circulate white blood cells and nutrients around our body’s tissues. Lymph has a number of functions which include carrying of water and nutrients to the blood. They also carry white blood cells plus other immune system cells from the bone marrow and thymus around our bodies. Helps to ensure your mouth and eyes are clean; water helps keep our mouth and eyes moist. This then means they are able to repel dirt, dust and parasites that could cause infections. Helps to lubricate the joints; when our joins are lubricated sufficiently they can help to prevent or treat arthritis and joint problems. Helps our brains to create serotonin; this is considered to be a chemical that has responsibility over maintaining mood balance. Adequate amounts of water could then help to reduce the onset of depression. Helps our brains to create melatonin; this is needed to help you sleep. Therefore a lack of melatonin could result in insomnia. There will be a number of additional benefits for you to drink enough water but those listed above should give you enough reason to evaluate how much you actually drink and whether you need to be drinking more. If you need to drink more then set yourself a New Years resolution to do just that. You can start by ensuring you have a glass of water as you wake up. Drinking when you wake up comes with additional benefits too. It rehydrates your body from the liquids that you have lost during your sleep. Gets your metabolism fired up and into action, which has been proven to increase your calorie burning potential throughout the day. Can leave you feeling more refreshed. So kick of 2016 the right way and have a healthier and happier year. Happy New Year to you all.